Long term monthly means, derived from years 1981 to 2010. 2.5 degree latitude x 2.5 degree longitude global grid (144x72). 88.75N - 88.75S, 1.25E - 358.75E. The monthly data set consists of two files containing monthly averaged precipitation rate values. Values are obtained from 5 kinds of satellite estimates (GPI,OPI,SSM/I scattering, SSM/I emission and MSU) and gauge data. The enhanced file also includes blended NCEP/NCAR Reanalysis Precipitation values. The other just includes the satellite estimates and gauge data. Pentad data is also available. This data set consists of monthly averaged precipitation rate values (mm/day). The data range is approximately 0 to 70mm/day. The pentad dataset consists of 73 pentads per year with the 12th pentad covering Feb 25-Mar 1 whether or not there is a leap year. The pentad starts on the date stored in the netCDF file. Reading in GrADS: If you read the data in GrADS, it will assume the values are 5 days apart the entire time period including leap years. This isn't correct so you may get the wrong dates. To handle this in GrADS, you can use a ddf file rather than using sdfopen and set the calendar options to 365_day_calendar. Or, you can just use the "t" values as each full year has 73 values starting Jan 1. PSD standard NetCDF 80 Mbyte file for each pentad file. Missing data is flagged with a value of -9.96921e+36f. The enhanced version has no missing; the standard version does. Xie, P., and P.A. Arkin, 1997: Global precipitation: A 17-year monthly analysis based on gauge observations, satellite estimates, and numerical model outputs. Bull. Amer. Meteor. Soc., 78, 2539 - 2558. 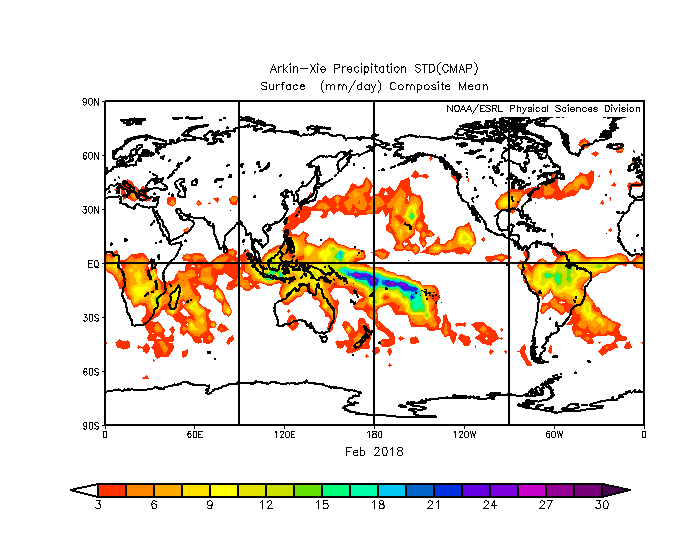 Please note: If you acquire CMAP Precipitation data products from PSD, we ask that you acknowledge us in your use of the data. This may be done by including text such as CMAP Precipitation data provided by the NOAA/OAR/ESRL PSD, Boulder, Colorado, USA, from their Web site at https://www.esrl.noaa.gov/psd/ in any documents or publications using these data. We would also appreciate receiving a copy of the relevant publications. This will help PSD to justify keeping the CMAP Precipitation data set freely available online in the future. Thank you! Huffman, G. J. and co-authors, 1997: The Global Precipitation Climatology Project (GPCP) combined data set. Bull. Amer. Meteor. Soc., 78, 5-20. Xie P., and P. A. Arkin, 1997: Global precipitation: a 17-year monthly analysis based on gauge observations, satellite estimates, and numerical model outputs. Bull. Amer. Meteor. Soc., 78, 2539-2558.